Each unit is built around a sturdy base with heavy duty hinges, solid steel latches and "NO" spiral wire corners to cause binding. 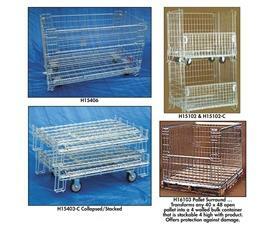 Electro Zinc plated, collapsible and stackable four high. Feet made of 1/2" steel and units include one half drop gate on long side. 16103 Pallet Surround ... transforms any 40" x 48" open pallet into a four walled bulk container that is stackable four high with product. Offers protection against damage. See Options tab for optional shelves. Optional Spring-Loaded Shelf Product No. For use with Wire Containers. Fits Wire Container Product No.